The institute will take place from Sunday, July 8, through Friday, July 13, on Marshall’s Huntington campus. HSTA is a partnership among numerous units of West Virginia University, Marshall University, West Virginia State University, the West Virginia Rural Health Education Partnership, the West Virginia Area Health Education Centers and many Appalachian communities. The program brings racial and ethnic minority, rural and/or low-income students and their teachers to Marshall each summer for laboratory, classroom and enrichment activities. Then, during the public school year, the program provides the infrastructure and support for community-based science projects mentored by teachers, scientists, health professions students and community volunteers. HSTA institutes are offered each summer at West Virginia State University and West Virginia University, in addition to Marshall. All HSTA students are members of HSTA Clubs in 26 counties throughout the state. The students participate in HSTA Club learning experiences, after regular school hours, from ninth to 12th grades. Clubs are administered by local governing boards and are generally held at high schools around the state. All HSTA students must attend two summer institutes. Students coming to the summer institute at Marshall were recently selected as new HSTA students, who will all start their club meetings in the fall, when schools start. Consequently, this is the students’ first HSTA experience. Once students have successfully completed their HSTA Club requirements from ninth to 12thgrades, notices are sent to universities across the state, notifying admission offices that they are HSTA Scholars and are eligible for the HSTA tuition waiver, as legislated. A student is provided with eight semesters of undergraduate tuition with the HSTA waiver. Marshall University also honors the graduate waiver for majors in health, science and technology; provides a partial waiver for medical school; and makes a waiver allowance in the School of Pharmacy. Typically, Cooley added, 100 percent of HSTA students attend college and graduate with baccalaureate and advanced degrees at an extraordinarily high rate. For further information, contact Cooley by e-mail at cooley@marshall.edu. 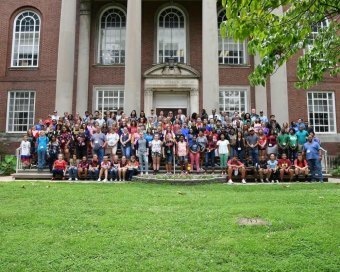 Photo: Participants in the 2017 HSTA summer institute posed for a picture on Marshall’s Huntington campus.